DUBAI - The world largest mall will rise soon in Dubai. 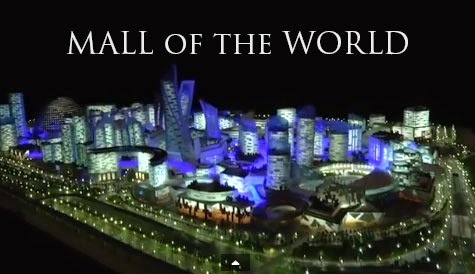 The Mall of the World is the grandiose projects of Dubai Holding that could occupy a 4,459,345 million square meters. The developer plans to build an indoor park, 100 hotels and apartments, health resorts and majestic theaters inside the mall. As it said in a statement, it "will comprise the largest indoor theme park in the world" covered by a glass dome that would be opened during winter season. Dubai ruler Sheikh Mohammed said, "Our ambitions are higher than having seasonal tourism. Tourism is key driver of our economy and we aim to make the UAE an attractive destination all year long." One of the great features of the Mall of the World is the pleasant temperature-controlled environments. They can easily change the so called 'climate' inside the mall during the summer months. Dubai officials expected to get more tourist each year because of the extravagant experience inside the Mall of the World. Dubai is the most popular city located at the South East coast of Persian Gulf, United Arab Emirates. For more information about the Mall of the World, kindly bookmark this page and share to your joined social networking sites. Comments or suggestions about "Mall of the World will rise soon in Dubai" is important to us, you may share it by using the comment box below.